In the 1990s the ROSAT x-ray observatory made an all-sky survey. By 2001, seven soft x-ray sources were found from the survey data, and shown to be neutron stars. They came to be known as the magnificent seven. The magnificent seven differ from most neutron stars in the way they appear to us. Most of the neutron stars we observe are either young and hot, meaning they are sources of hard x-rays, or they are pulsars, meaning that their magnetic fields are aligned in such a way that it sweeps a beam of intense energy in our direction like a lighthouse. The seven are cooler than other neutron stars. While young neutron stars can have surface temperatures of more than a million Kelvin, the seven have temperatures of 500,000 to 800,000 Kelvin, and they lack the hard x-ray spectrum of other neutron stars. 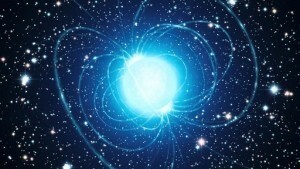 Neutron stars cool over time, so by their temperatures they are middle-aged, being about 100,000 years old or so. The light they give off follows a blackbody pattern, which is how we know their temperatures. This also means we can calculate something called the flux density. The flux density is a measure of the amount of light an object gives off per unit area. If you know the flux density and size of an object, then you can calculate its brightness, or absolute magnitude. This is useful because we can also measure how bright an object appears (apparent magnitude), and by comparing the two we can calculate the object’s distance. The difficulty is that we don’t know the precise size of these neutron stars. From what we know of neutron stars in general they are likely between 12 and 20 kilometers in diameter, but it’s hard to be more precise. From their apparent brightness, this means they are between 500 to 1500 light years away, which is fairly close. Ideally it would be nice to have an alternative distance measurement to compare with. For stars in this distance range we could use the method of parallax, which is similar to the depth perception of human vision. By measuring the position of a star at different times of the year (when the Earth has moved from one side of its orbit to the other), we can observe the apparent shift of the star relative to more distant stars. With a bit of trigonometry we can accurately determine a star’s distance. But these neutron stars don’t give off much visible light, so that trick doesn’t work with them. Still, we do have some indirect evidence that our distance estimates are reasonable. Stars are not fixed in space, but instead are moving relative to each other. For distant stars this motion is too small to observe directly, but close stars exhibit this as proper motion, or the gradual changing of position relative to other stars. Large proper motion is an indication that a star is relatively close. 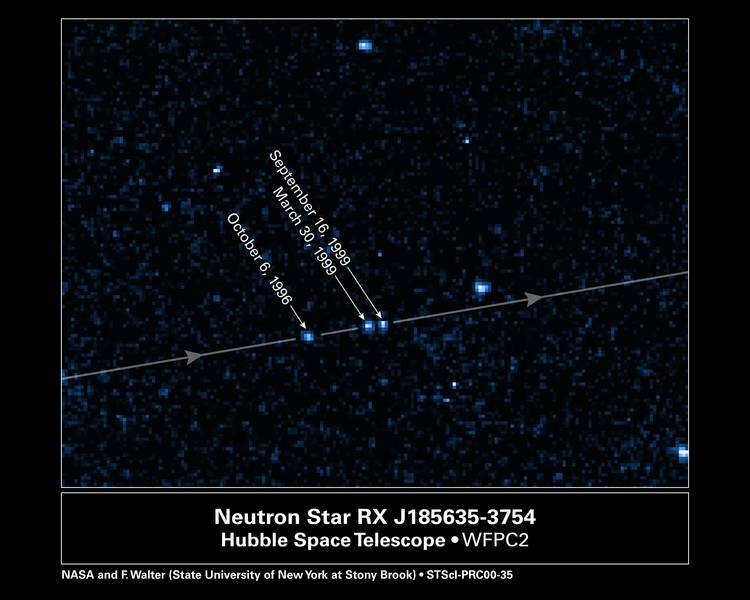 We’ve observed such a proper motion with some of these neutron stars, as seen in the image above. This shift in only a few years is a good indication of the closeness of the neutron stars. Because of their closeness and age, the magnificent seven provide an opportunity to learn more about the structure of neutron stars. In particular, further observation should provide insight on the equation of state of a neutron star’s interior, which would help us understand the interactions of dense, high-temperature nucleons. Learning more about that would be pretty magnificent indeed. 100,000 years old is still not much in cosmological terms isn’t it? Wouldn’t we expect far more older neutron stars a lot closer to us knowing that 7 ‘young’ ones are relatively close? I don’t know how much light a – let’s say 5 billion year old neutron star gives but I assume that will be very little. And as you said – they are very small in size. But shouldn’t our galaxy just be full of those old neutron stars?